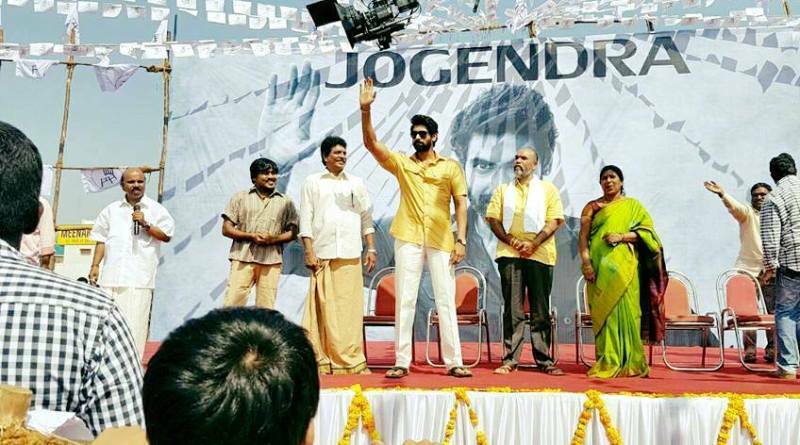 Radha Jogendra (Rana Daggubati) narrates his story to a film crew as he awaits execution. He was once a simple money lender with a shrewd mind and a moral compass provided by his wife Radha (Kajal). After a couple of years of marriage Radha finally fell pregnant and the happy couple were over the moon. Sadly Radha lost the baby and her ability to conceive again after being attacked for accidentally infringing on the imaginary rights of the village leader’s wife. Yes, I know. Jogendra decides if he was the village head nobody would insult Radha again. So he schemes his way into the role. Then he eyes off the MLA position. Then a ministry. Then the CM gig. He always justifies his ambition as his means of giving Radha the best in life, but he is playing the game for the sake of power too. Can he keep outwitting his opponents? Where will he draw the line? And what does Radha make of it all? Teja’s “Nene Raju Nene Mantri” is set in the murky world of politics but has all the flair and improbability of a cowboy film. It is great fun if you can ignore the death toll, and I always like a decent comeuppance. Jogendra (Rana) adores his wife, but everyone else is expendable or interchangeable. He is deceptively simple looking, but his mind is subtle and calculating. Rana dominates his scenes and not just because he is twice the size of anyone else in the film. He is fully at home as the morally dubious but highly effective Jogendra and delivers his one-liners and proverbs with great relish. The action scenes are often brutal but then he switches to a convincing warmth and playfulness in his scenes with Kajal. There’s more complexity to Jogendra than I was expecting, and a lot more of the mass hero hijinks than I expected too. I laughed a lot at Jogendra’s amazing aptitude for killing, and his ability to stay on task. The wardrobe team came up with a good look for Rana. Well, once I got over my confusion at seeing him in a shirt. There’s lots of monochromatic linens, a slightly modernised traditional look, and a fairly subtle way to emphasise his physique without it looking like his clothes were painted on. What else…Oh yes, there is a hulk-out shirt ripping moment, just to prove the gym sessions haven’t ended. Radha (Kajal) is on the surface too saintly. But I really liked her chemistry with Rana, and some of her less sweet moments saved Radha for me. I loved when she fired up and told Jogendra she’d forgive so many of his mistakes (like shagging Devika Rani) but not the thing he just said. Or when he chided her for acting childish and she said it was because they didn’t have a child, and they both looked stricken. I didn’t like that everyone except Jogendra saw Radha’s value relative to her having a baby. She had no purpose or context in the script other than “wife”, so I was impressed with Kajal for bringing a bit more to the table. She showed Radha’s growing discomfort with her husband’s actions and her inner conflict because she knew he did it all for her. The wardrobe team dressed her in beautiful sarees that increased in opulence but always suited Radha, and Kajal looked comfortable in her skin. However. Radha was the perfect wife who would sacrifice anything for husband but that final sacrifice was just DUMB. The method struck me as quite improbable. Having said that, I still felt intensely sad when the cortege visited surrounding villages. Devika Rani (Catherine Tresa) is a badly dressed avatar of media whoredom. Her painfully high silver wedge sandals and the almost there skirts were hideous. I guess the wardrobe team can’t love all their cast members equally. While it is good that Devika Rani was shown to be a confident woman I was concerned that none of her social media strategies were sound. Never hire anyone who says their plan is to send everything viral. And her character made little sense. But it does speak to the thinking around campaigning and media manipulation, with clicktivism and slacktivism getting a passing nod even if I am not sure that is what Teja was aiming at. Her major achievement in the film might have been that she had zero chemistry with Rana. What was probably supposed to be a titillating scene was just awkward and cold, with Rana looking like he was resigned to an invasive medical procedure. Catherine has some convincing moments in solo scenes, but as soon as Rana or Kajal shows up her lack of acting skill is all too evident. The villains are unfortunately quite familiar types from everyday life. The cop who takes bribes (Ajay), the gangster turned politician (Padeep Rawat), career politicians with no objective beyond lining their pockets (Tanikella Bharani, Ashutosh Rana, Posani Krishna Murali). All of these performances were solid, and there was some genuine menace and just nastiness in their interactions with Jogendra. Rana looked like he was having the time of his life threatening Ajay. Ashutosh Rana’s character didn’t know if he was coming or going sometimes, with a wry use of proverbs to explain how proverb-spouting Jogendra could beat him. I quite liked the one that went “if the cat is blind a mouse can hit it with a stick”. A convenient morality permeates the film. If Jogendra kills someone (or a hundred someones), don’t take it to heart. They were all bad so he was doing a good thing. Well, except for one. Navdeep wasn’t given much to do as Shiva but he managed to make an impression as one of the only people who held Jogendra morally accountable. Anoop Ruben’s soundtrack tends towards the anthemic, which suits the purposeful journey Jogendra is on. They didn’t make Kajal and Rana dance which is also a blessing. There was a bit of convulsive twitching in one song but then lots of walking (him) and a bit of frolicking (her). Good decision dance team! I loved the special appearance by dance master Shiva Shankar. There is some dodgy VFX but realistic effects could have been overwhelming in the gory bits. And there is a sound effect for everything. There’s nothing new or outstanding in the direction but I feel the pace was pretty well managed until the finale which was a little drawn out. The dialogues contain proverbs and local sayings and I think the subtitlers did a good job of conveying some of the flavour. It’s an engaging story with Rana and Kajal coming up with the goods and a decent support cast. I should be more concerned about the body count, the gender roles, the apathy surrounding politics, the problem solving preferences of a sociopathic charmer. But I was highly entertained and amused by the machinations and mayhem. Because he is Jogendra. If all you want in a movie is plenty of gory fight scenes and a couple of good tunes then Sarrainodu is probably the film for you. But on the other hand, if you prefer a cohesive story with an actual plotline, semi-plausible romance and an attempt at more than one-dimensional stock characters, then best to steer clear. The one saving grace in Sarrainodu is Allu Arjun, who manages to entertain even while playing a violent, psychopathic stalker who nonetheless is actually the hero. Bunny is Gana, ex-military, although ‘ex-‘ exactly what is never specified in a general vagueness that afflicts every character. Gana spends his days bashing up offenders his lawyer uncle Sripathi (Srikanth) has failed to bring to justice in court, much to the frustration of his father (Jayaprakash) who feels he should be doing something more worthwhile with his life. The rest of the family dramatics follow Telugu Mass Movie Formula No 1, with the addition of a comedy track featuring Gana’s sister-in-law (Vidyullekha Raman), a Tamilian obsessed to the point of mania with sambar and Brahmi as a philandering brother-in-law. Neither of the two comedy tracks is funny and Brahmi’s sleazy character is particularly off with little relevance to the rest of the film but then that’s nothing unusual for this type of film. With some nice symmetry, while Gana is belting the living daylights out of gangsters to reclaim land they appropriated, uber-villain Vairam Dhanush (Aadhi) is cheerfully slaughtering villagers to grab their land for his pipeline project. Vairam likes the sound of his own voice and witters on about ‘background’ as if the concept may have some significance to the plot later on. Perhaps it was meant to, but since the background of neither Gana nor Vairam (or anyone else for that matter) is given anything more than a brief mention, Vairam’s insistence on the concept makes little sense. As a villain, Aadhi has a good sneer and appears appropriately nasty, but his character is so one-dimensional that Vairam himself has very little impact. He’s evil purely for the sake of being evil and naturally (adhering to TMMFNo1) he’s rich and privileged with the Chief Minister as his father and a large criminal network at his beck and call. 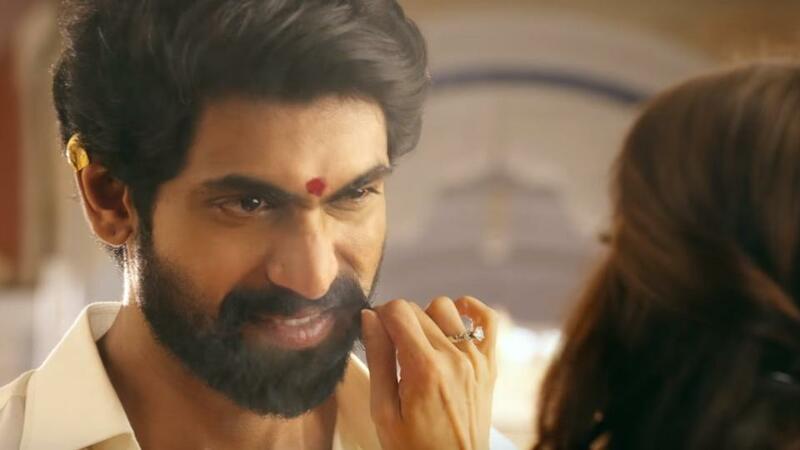 Aadhi tries hard to give Vairam some personality but he has little to work with and his villain pales beside the spectacle of Gana’s righteous fury. Gana falls in love with Hansitha Reddy (Catherine Tresa), oddly cast as a very unlikely MLA, and decides to follow the usual path to true love (TMMFNo1 again) by stalking the girl until she falls for his charms. This is even less viable than usual given that as an MLA Hansitha has the wherewithal to send Gana about his business, but bizarrely she declares her love for him instead. The path to true love is not smooth however and there is a complication in the form of Maha Lakshmi (Rakul Preet Singh), who falls heavily for Gana when he rescues her from Vairam’s thugs. Sadly neither of the romances works well at any point in the film and there is zero chemistry between Bunny and his two leading ladies, probably due to a lack of screen time together and therefore little opportunity for any relationships to develop. Bunny is on top form here and single-handedly manages to hold the film together despite the many flaws and gaping holes in the barely-there plot. Whether he’s fighting or dancing he looks amazingly fit, and effortlessly switches between his devotion to Hansitha and his uncontrollable fury when he sees injustice against the helpless. As always he looks awesome in the song sequences where every dance routine features excellent footwork, amazing energy and that trademark Bunny grin. S.S. Thaman’s songs are catchy and memorable too, and the choreography is well suited to showcase the stylish star. He gets to wear some incredibly bright and colourful costumes and fares rather better in the wardrobe department than Catherine Tresca and Rakul Preet Singh, who both suffer from the curse of inappropriately skimpy Western style costumes in the songs, although both look stunning for the rest of the film. Anjali has a better time of it with her guest appearance in the item song blockbuster – which I love for many reasons, not the least of which being that one of the backing dancers is totally rocking a cool pair of specs – you go girl! The other aspect of Sarrainodu that works well is the action, with fight sequences that are well imagined and expertly staged despite being incredibly violent and completely over the top. Where else would you have a fight scene on roller blades for example, or a wonderful stand-off by the hero beating numerous thugs while the participants in Puli Kali leap energetically around the fight? Most of the action contains a lot of slow-motion, but this highlights the choreography and showcases the small vignettes in the background – the bystanders, a horse bucking as it runs past and the portentously displaced gravel with every one of Gana’s footsteps. And it’s just as well that the action sequences are good as there are a lot of them – Gana spends most of the film fighting in increasingly violent and bloody encounters, throwing thugs around like confetti at a wedding and inflicting maximum damage on Vairam’s crime empire. Boyapati Srinu adds almost every possible masala ingredient in this mish-mash of a film, but fails to provide a coherent plot or any rationale to his characters. I love a good mass entertainer – I don’t expect great character development or logic and realism in the plot, but there does need to be an actual plot and some sort of reason for the antagonism between the hero and the villain.Sarrainodu does not succeed by any of those criteria and yet I still enjoyed the film. The fight scenes are excellent, the dance sequences well worth watching and Allu Arjun puts in a magnificent performance that just about manages to overcome all the flaws in the film. One for the fans sure, but if you’re a fan this is Bunny at his best and that’s all that’s needed. 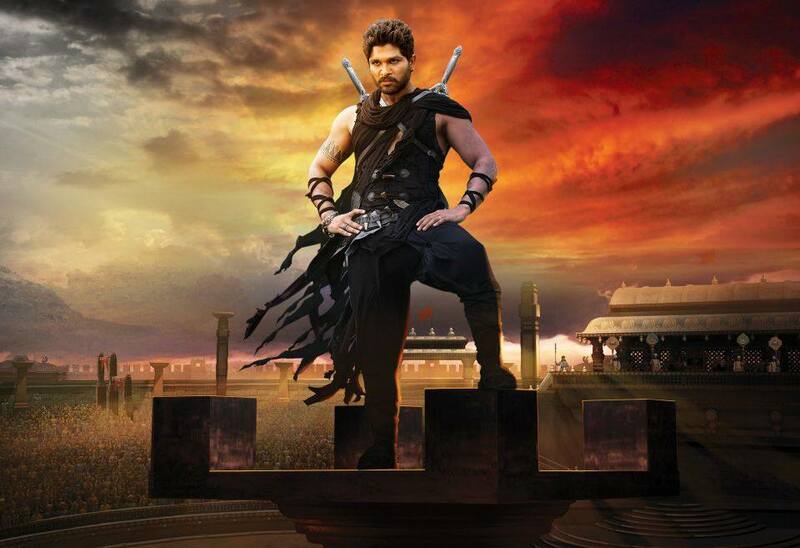 If Rudhramadevi had been made in 1956 I’d have loved it, no question. But Gunasekhar struggles to realise his grand vision and the ripping story drags at times. The main cast give their all, but they can’t compensate for some poor directorial decisions and sloppy execution. The first thing that hit me was the VFX. I thought it was maybe a deliberate stylistic choice as there are animated montages that look like a childs picture book. But it is just shonky quality, used too liberally, and with poor judgement. At least it distracted me from wondering what Marco Polo’s stuck on beard was made of. And why Marco Polo was in the film. The story is so interesting this should have almost written itself. A girl is raised as a boy and keeps up the pretence to protect her kingdom for as long as she can. But Gunasekhar spends far too much time with the various enemies and uses loads of clunky “As you know Bob” exposition. 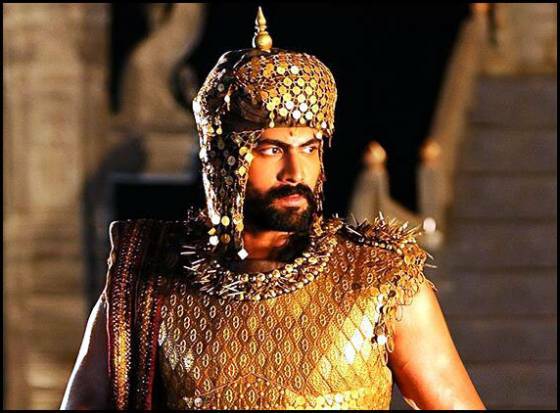 I felt that there were some holes in the film and Gunasekhar was trying to paper over those gaps with other techniques including a Mega voiceover and a peasant who announced every new character with bio as well as voicing the people’s dissatisfaction with their rulers. Anushka owns every frame she is in. She adjusts her posture and facial muscles so there is a clear distinction between Rudradeva and Rudhramadevi and is convincingly commanding. She has some weird darkening makeup on as a boy, but it does allow her to look stunningly radiant when she girls up. Her closest female friends are Nithya Menen as her wife Muktamba and Catherine Tresa as The Other One Who doesn’t Wear Much, and there is a lightness and ease in the way Anushka moves as she drops the pretence and heavy armour undershirt to dance in the “Yay! I’m a girl” numbers. She did her damnedest in the tandav but while her expressions told a powerful story, her dancing was not as compelling. Rudhramadevi used Veerabhadra’s feelings for her to get him back on task, but she evinced far more concern about Muktamba’s reaction and wellbeing. That ruthlessness and emotional intelligence wasn’t really explored and I felt the film needed to reveal how she ruled, not just show a sequence of events. I put that clip in just for some shirtless Rana. He looks so chuffed when he is prancing almost in time. I knew a “Zorro” moment was nigh when Rudradeva wore a blue tunic done up with pink princess ribbons, and the gender reveal is a bit ho-hum. Veerabhadra took the whole “Dude, you’re not a dude” revelation quite well, all things considered. There is little sexual chemistry between Rudhramadevi and Veerabhadra, but the actors have a nice rapport, like childhood friends. I enjoyed moments like when Rana playfully tweaked Anushka’s nose as he said goodbye. While the writing skimmed the surface of characters emotional lives, the actors added their own flavour. 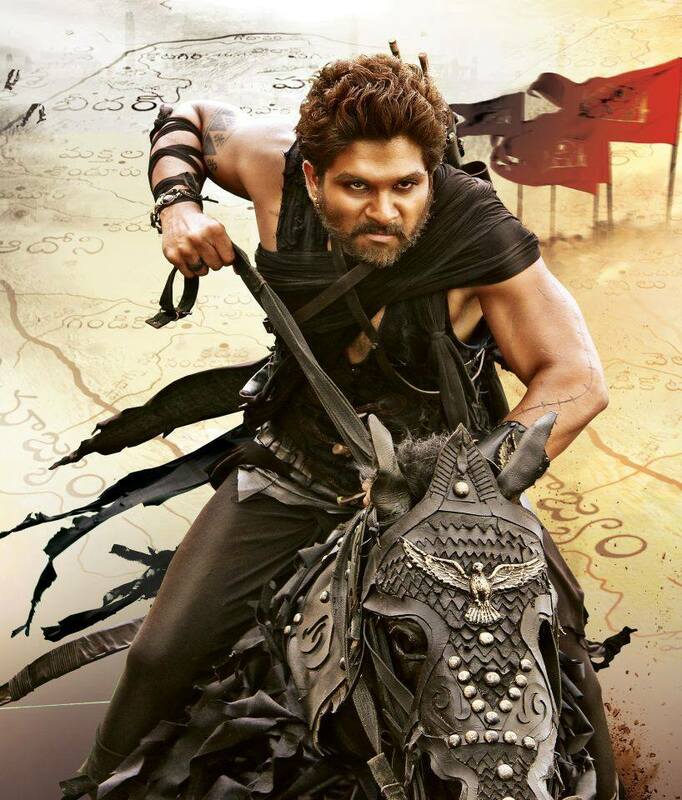 Gona Ganna Reddy (Bunny) and his horse seem to have ridden in from a different film; something more gothic perhaps or even a KPop music video (Jaejoong’s stylist may be moonlighting as a Telugu horse costume designer). Bunny plays his character as unrelentingly dour and with one facial expression, but his one liners got the audience cheering. And he rarely blinks. It’s intense and unsettling after a while. The support cast is huge. Hari Hara Devudu (Suman) and Murari Devudu (Aditya) are the Statler and Waldorf of villains. They sit back and critique everyone else but rarely do anything themselves, unless you count letting their allies die horrible deaths. Their brother Naga Devudu (Baba Sehgal) shows commendable willingness to really go for the snake theme. Nithya Menen is underutilized as Muktamba. I enjoyed her scenes with Anushka and thought her decision to respect the sacrifice and say nothing was interesting. This contrasted with the shouty peasants who just flat out refused to accept a woman, despite a rousing Prakash Raj girl power speech. Prakash Raj is in good form as Shiva Devaiah, the mastermind of the scheme that sees Rudhramadevi raised as the boy Rudradeva. Villain Mahadeva (Vikramjeet Virk) spends most of the film prancing atop a phallic tower made of polystyrene. Amusing, but you know a great hero or heroine deserves a genuinely scary bad guy and he is not the real deal no matter how many people he kills out of spite. Hamsa Nandini is slinky and duplicitous, the Bond girl of courtly spies. Gunasekhar’s massed set pieces lack richness. If you arrange a formation of extras with one or two carefully out of position people for randomness, but then use that same formation scores of times over it ends up looking ridiculous with the pattern repetition of those supposedly random bodies. A critical battle scene started with a cool idea – one army emerging in a serpent formation as their opponents attacked in an eagle formation. But it went on forever and looked far too fake. I was reminded of the similar but excellent lotus and arrow scene in Magadheera. One of the few actors I could imagine would happily rappel down a structure (possibly without even checking there was a rope), Bunny was plagued with dodgy wire work. Anushka was also caught so that her feet didn’t quite hit the ground or was frozen in awkward and unconvincing poses in midair. Maybe it was supposed to look good in 3D but I can’t imagine it would. And too many fight scenes and chases were sped up to slapstick comedy pace. There is abundant weird CGI, possibly a workaround for the 3D version, although I should have remembered the effects in Okkadu. For example, when a drawbridge is being lowered they faked the cogs and ropes too which you’d think would be doable and cheaper for real. The climax scene as Rudhramadevi and elephant bring doom upon her enemies should be thrilling but it is just opportunity to crank up the bad CGI. The use of CGI elephants seemed unnecessarily frequent especially when in many scenes there was no obvious risk of physical harm to an animal – why not use a real one? And there seemed to be a bit of tusk whitening done in post production that was distractingly odd. A big shoutout to the helmet and armour department. No design was too silly or impractical for them to try. I really wish I could find a picture of Bunny’s Glomesh helmet from the final battle, but you will just have to make do with Rana’s special dressing up armour. Despite the negatives I really appreciate seeing Anushka as the lead with so much screen time in an awesome story. Bunny and Rana bring more interest to their characters than the screenplay demands. I would have liked to see more relationship development generally, and especially between the ladies given the story is of a woman pretending to be a man. I really wish the film had been better executed as I can see what it might have been, and the gap between what was delivered and that potential is frustrating.